Looking for an effective way to build positive behaviors and develop strengths in children? 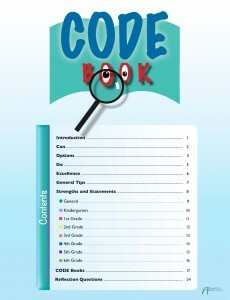 CODE Book™ is a fun and engaging process for children, ages 5 to 12, to develop strengths which shape character. 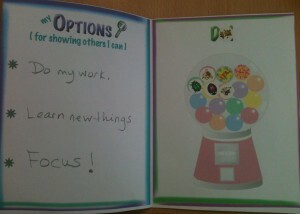 It provides a practical way to set and track goals that enhance social and emotional intelligence. Using positive reinforcement, CODE Book™ links small successes in a child’s personal development with feelings of accomplishment. This educational resource is a tool for teachers and student support professionals in schools to assist children who would benefit from extra support. 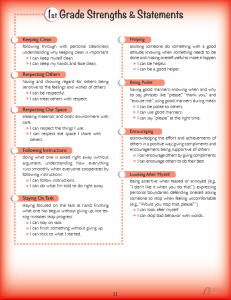 It can also be used by counselors or parents to explicitly teach children about positive behaviors. How does CODE Book™ help children? CODE Book™ guides children in developing the skills, values, attitudes, and conduct that will benefit their relationships and futures. What is included in CODE Book™? Instructions and ideas for the four stages of CODE Book™: Can, Options, Do and Excellence. 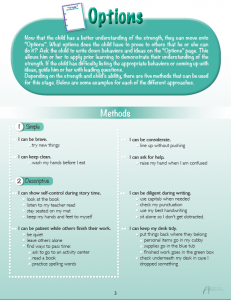 A list of strengths that includes definitions and suggested affirmative statements for children in kindergarten to sixth grade. A collection of CODE Books™ to choose from, which can be folded into booklets. This is a comprehensive resource treasure. It is filled with easy to use, but very practical activities for children. This is a must for schools and parents. I can’t wait to see how children change when they are given this opportunity. As an author and an educator, the one phrase that comes to mind when I think about Ms. Abraham, is “meaningful engagement”. I had the privilege to preview her latest work entitled,”CODE Book”, and from opening statement to final words, it was a display of genius. This work simplifies the process of encouraging pro-social behaviors and emotional intelligence of children from preschool to adolescence into young adulthood. at every stage of their growth. Activities are age appropriate, and the content showed a deep understanding of childhood development, and various modalities of behavior reinforcement. For parents, educators, and mental/behavioral health clinicians, the activities described in the book are easily adaptable to diverse settings as a resource aid. This book, one in a series of works authored by Ms. Abraham, should be required reading for all adults who interact with children and support their comprehensive development. Ms. Abraham provides a creative, fun and effective medium for meaningful engagement with youngsters to enhance emotional literacy, and of course, this comes with my most heartfelt recommendation. I have been working with a child using your CODE Book design and would like you to know it was fantastic and would use it again. The child I was working with needed help to develop social interaction and also be able to follow daily classroom activities and I found that the implementation of the CODE book helped to achieve this. 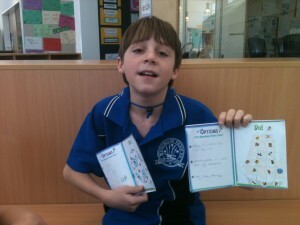 He was able to visually see his progress and enjoyed placing a sticker in the book when he achieved his goal. I found the CODE Book simple and effective to use and I like that there is no limit to the amount of books you use with the child. I certainly see the value of a teacher or school counselor implementing this in a classroom. Our school works with a mental health counseling agency that works with some individual students and their families to target specific behaviors and routines. I think this would be a great tool for them to use and teach the parents to use it as well. Both of the twins actually chose the ones I wanted them to! Using this as a tool to facilitate dialogue is good; it keeps the skill in their awareness, that’s effective. They feel really good about themselves when they receive a stamp it’s like they’ve achieved something. My daughter wanted to do more than one skill at a time. A child who is struggling with anxiety, social skills, appropriate behavior, or engagement needs to be reminded that he or she is capable. 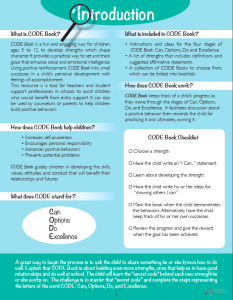 CODE Book™ uses positive reinforcement to educate and inspire children. It also increases their awareness of personal responsibility, strengthens their capacity for learning new skills and attitudes, and highlights their accomplishments on the way to success. Click here to purchase CODE Book™ digitally for $12USD.